Unleash the powers of Final Fantasy\'s Dragoon class upon Skyrim with three devastating new powers! Feel free to modify Powers of the Dragoon at your leisure, especially if you feel that you could improve the effects of the mod in any way. However, you must seek my permission before attempting to upload any files using assets from this mod. Elysees, whose Papyrus source code was invaluable in teaching me how to force idle animations with Powers and Spells. Powers of the Dragoon utilises Elysees' Papyrus syntax method, but does not use any of their assets or scripts. Bethesda, for reasons that should be obvious. The staff at Nexus mod, for facilitating and maintaining this fantastic system. Unleash the fury of the Dragoon Job class from Final Fantasy with Powers of the Dragoon! 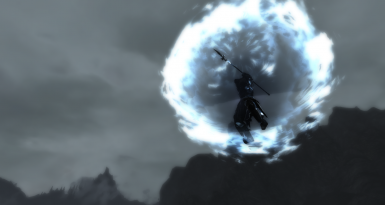 This mod adds 3 new Lesser Powers into the game, based on either the direct powers of the FF-style Dragoons or their mythos. 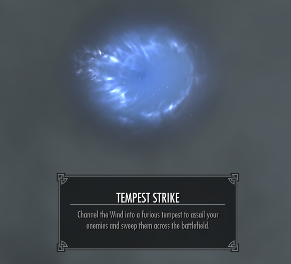 The powers are automatically added to the player's spell arsenal once the mod is installed. 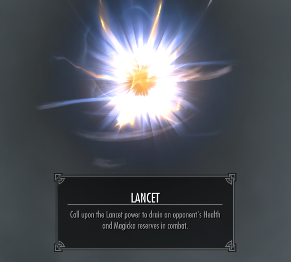 The powers drain a fixed percentage of the player's maximum Magicka when cast; 50% for Lancet and Tempest Strike, and 75% for High Jump. All of these powers require a weapon to be equipped in the player's hand, but not a Bow or Crossbow. This is a targeted power, and requires the player to be directly facing an enemy. When cast, the Dovahkiin will launch a shockwave attack at the enemy, knocking them onto the ground. 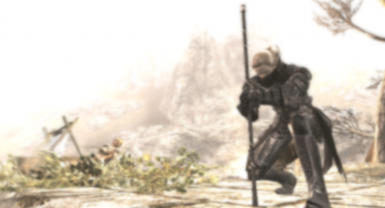 Immediately afterwards, the Dovahkiin jumps, teleporting away and reappearing above the enemy's head, before stabbing down with their equipped weapon. Upon impact with the ground, a vicious explosive shockwave will be generated, damaging and ragdolling enemies in a circle around the player. 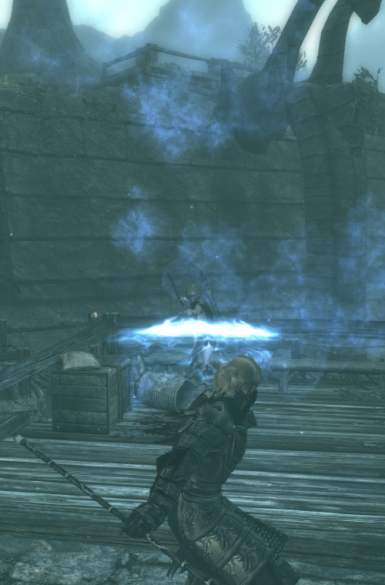 The Dovahkiin charges their power, then spins and launches a shockwave attack at the enemy. 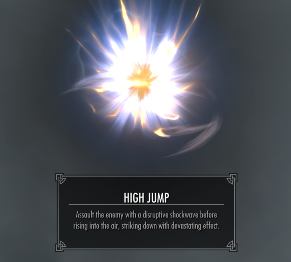 All NPCs hit with this shockwave will rise up into the air, while the Dovahkiin drains their health and Magicka. 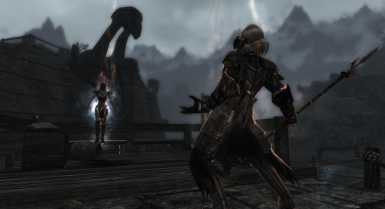 At the end of the attack, the Dovahkiin terminates the drain connection by stabbing down with their weapon and generating an explosion centered around the target. 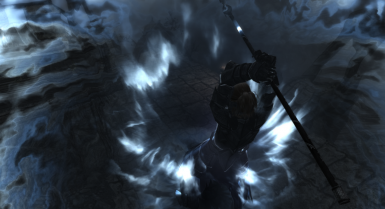 The Dovahkiin whips the surrounding wind into a fury, then slams their weapon down to direct it into a vicious, high-speed cyclone that sweeps out in front of them. All enemies caught in its path are launched into the air. 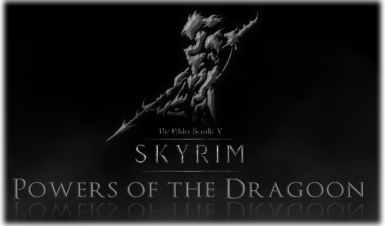 -Unpack the contents of the Powers of the Dragoon.7z file into your Skyrim/Data directory. Activate the .esp through the launcher, and you're all set. -If the player is not looking directly at their target when attempting to use High Jump, then the power will not be performed. This is a result of the spell being a "Targeted Actor" spell, so the effect will not be cast if the player is not directly looking at (crosshairs centred over) the opponent. Simply make sure that you are facing an enemy actor directly, and the effect should play as intended.